An inaugural program and newly opened center at California University of Pennsylvania funded by the largest gift in the school’s history has its sights set on making a considerable impact on the local learning community. The Rutledge Institute for Early Childhood Education, which opened its doors at the start of the 2018-19 academic year, is a place where children can learn and grow, young professionals can develop and become leaders and families can be strengthened and lifted, university officials say. The preschool facility and learning program on the Cal U campus is an innovative attempt to meet the educational needs of multiple factions of students, funded through a $4.2 million gift presented to the university last year from Karen and Tom Rutledge, of Greenwich, Conn.
Tom Rutledge, a 1977 graduate of Cal U, is chairman and CEO of Charter Communications Inc., the second-largest cable provider in the U.S.
“The Rutledges had a vision for a center that would do several things, and that included providing opportunities to young, preschool-aged children that would not otherwise have access to an education, and to prepare college students with experience that will allow them graduate with a degree in preschool education,” said Christine Kindl, Cal U spokeswoman. The institute provides a home for both preschool aged children and early childhood educators in-the-making, funding annual scholarships for 20 local children to attend the preschool program, and a class of 10 university students each year — called Rutledge Institute Scholars — to study teaching. Over four years, the scholars work under the direction of Cal U faculty and certified preschool teachers to gain hands-on teaching experience in the classroom implementing innovative preschool curricula in STREAM, or science, technology, reading, engineering, art and math. “We’re looking for academically talented students that have the ability to be effective educators,” said Dr. Rebecca Maddas, coordinator of the Rutledge Scholars program. Currently, 11 children attend the Rutledge Institute preschool program, and seven Rutledge Institute Scholars are enrolled in first-year classes. In the future, the institute anticipates enrolling 20 children annually, with a cohort of 10 first-year college students added each fall based on a rigorous set of academic and nonacademic qualifications. Maddas said the university anticipates filling all 10 Rutledge Institute Scholar slots for the 2019-20 academic year. Each Rutledge Institute Scholar receives an annual scholarship that covers the cost of tuition, academic fees and on-campus housing. By senior year, they will be in the classroom working with children five days a week, Maddas said. Scholars graduate with a bachelor’s degree, Pennsylvania teaching certification and an Integrative STEM Education Endorsement, with a possibility to obtain additional credentials. 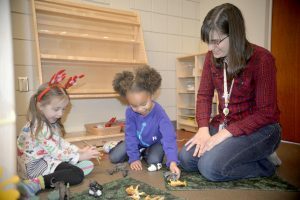 “There’s a huge push now for early childhood educators to be highly trained,” said Maddas, adding that the program focuses on developing in students practical competence by giving them field experience in the preschool classroom. “What is important in training our teachers is that they have a deep knowledge in childhood development. This is one of very few programs that gets students in the classroom their freshman year,” Maddas said. Space in Morgan Learning Resource Center, most recently used as a storage facility, was renovated to house the on-campus preschool classrooms, which opened in fall 2018. The institute brings to campus teachers from The Village, a nationally accredited early childhood education center in California, to provide high-quality preschool education to eligible children ages 3-5. The curriculum used at the Rutledge Institute centers on learning through play, where children make their own choices, said Cherie Sears, director of the Rutledge Institute Preschool Program and president of The Village. Children cycle through various stations in the classroom created for various subjects like art, writing, science, music, math and fine motor skills. “It’s an important part of learning self-regulation. They choose what they want to do,” Sears said. With eight teachers and, eventually, as many as 40 scholars rotating through field experience in the institute’s two classrooms, the high child-to-staff ratio will benefit the young learners attending the preschool, said Sears. Reserved for those with a financial need, the institute requires families to go through an interview process to “ensure they are committed to education,” said Sears.